When Ronald Reagan entered the White House in January 1981, he had visions of a more muscular foreign policy, which required an increase in the country's military strength. The new president believed that the Soviet Union understood and respected strength; consequently, his administration supported a strong defense policy. To direct the revitalization of the navy, President Reagan appointed John F. Lehman, Jr., as secretary of the navy. Lehman set about to the strengthen the navy and establish a coherent shipbuilding policy. "A skilled practitioner of the strategic priesthood," Lehman believed that the navy had to operate at least fifteen attack carriers to execute his aggressive maritime strategy.1 This was the minimum number that he felt was necessary to deal with limited wars, peacetime interventions, or fighting a global war with conventional or nuclear arms. For the first time since the Vietnam War years, Congress and the administration seemed determined to support a real increase in the navy's strength. Exploiting the mandate on Capitol Hill for Reagan's military, he asked Congress to approve a shipbuilding program that would lead to a six-hundred-ship navy by the end of the decade. By December 1982 Lehman had obtained congressional approval to build more than 100 additional ships, which, when added to the 479 afloat, would come close to his goal for a six-hundred-ship navy. Included in the plan was a replacement program for auxiliaries and mobile logistic support ships that contained long-term provisions to build a new class of oilers and a new AOE. Funding for the first of the new oilers was authorized in the FY 1982 budget at a cost of $199.1 million.2 Construction of three more oilers in the class was scheduled for the remainder of Lehman's five-year program. Henry J. Kaiser breaking the long-standing tradition of naming oilers after rivers. Henry Kaiser, a prominent engineering contractor in the 1930s noted for his dam and bridge building achievements,3 won additional fame in World War II for his exploits as a shipbuilder establishing a chain of seven shipyards on the Pacific Coast building 1,460 ships for the U.S. Maritime Commission. Under Kaiser's leadership, these yards developed a reputation for building ships at breakneck speeds. The fastest was achieved by the Richmond Yard No. 2 in November 1942 when it built the Liberty Ship Robert E. Peary in just four and a half days from keel laying to launching--a record which still stands. The study conducted by the Pacific Fleet revealed the need for a fleet oiler whose primary mission would be to provide one-stop replenishment to small surface combatants and amphibious units. The new oiler would also provide fuel for AOEs and AORs (consolidation of fuel) and could refuel CV battle groups directly, although this was considered a secondary mission. As envisioned by the Pacific Fleet, the new vessel would be designed along the lines of a stretched oiler and would have the capacity to provide replenishment of small quantities of ammunition and provisions, but would have fewer delivery stations and a crew smaller than an AOR. The latter would cut operating costs consistent with the prevailing policy of manpower reduction. Unfortunately, the shipbuilding program initiated in 1975 only called for a "one for one" replacement of similar MLSF-type ships. Thus the navy had to settle for the five AOs of the Cimarron class--the most austere oilers ever constructed under a navy-funded building program. 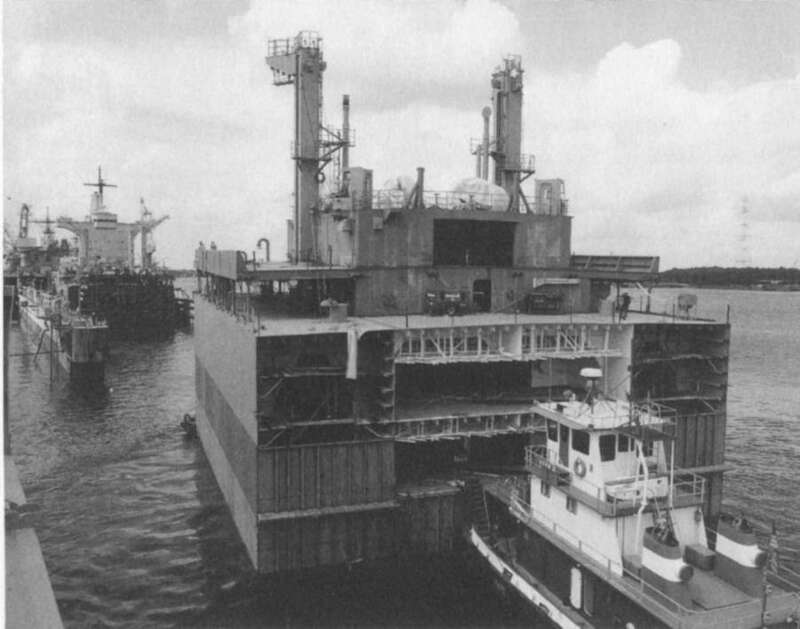 The new ship, designated as the AO-187 class, was designed to transport bulk petroleum products (JP-5 jet fuel and Diesel Fuel Marine) from shore depots to combatants and support forces underway--its primary mission--though it would have the capability to deliver limited amounts of freight, cargo water, mail, and personnel. For reasons of economy, the CNO directed that the design should adhere to commercial and MSC standards except where noncommercial features were needed to assure safety in its mission as a fleet oiler. Included in this category were cargo quality control and accountability and safety. The ship also had to be compatible with existing fleet units with regard to UNREP, VERTREP (via helicopter), cargo tankage, piping, pumping, and naval communications gear. When the Henry J. Kaiser entered service on 19 December 1986, the U.S. Navy (via the MSC) was still operating five World War II vintage tankers of the Mispillion class. Although these ships had been jumboized in the mid-1960s, the entire class was over forty years of age. They were to be replaced by the AO-187s, as were the five ships of the Neosho (AO-143) class dating from the mid-1950s. By 1987 appropriations had been approved for nine Henry J. Kaiser-class tankers with funding proposed for another ten at the rate of two per year through 1991. U.S. Navy Underway Replenishment Fleet," 24. Life Extension Program (SLEP). Yet another was dedicated to the training role, setting the maximum number of CVBGs at any one time at thirteen. The force structure to provide logistic support at sea for these groups was organized around four types: the multiproduct ship (AOEs and AORs), straight oilers (AOs), ammunition ships (AEs), and stores ships (AFSs). Since a task force can only travel as fast as its slowest vessel, the assignment of a combat logistics ship to the battle group reduced the speed of the task force--normally around 30 knots--to the maximum speed of the AOE or AOR deployed. This was not a very severe handicap when fast combat-support ships (AOEs) with their 26-knot speed traveled with the CVBG. This was not the case with replenishment oilers or ammunition ships that were expected to team up with the AOR. These ships were limited to 20 knots, a speed that would seriously affect the operational capabilities of carrier battle groups. constructed), which forced the navy to rely on less-capable AORs (seven were constructed). Thus, in the event of a major war, the majority of carrier battle groups would have to operate with replenishment oilers. The replenishment oiler's slower speed has an important influence on battle groups' operations and tactics. For example speed is frequently cited as an effective tactic for evading enemy submarines. Attack submarines hunt most effectively when they are traveling at relatively slower speeds. At higher speeds, the noise created by the submarine's propagation through the ocean may degrade, and perhaps eliminate altogether, its sensors' ability to locate ships and other submarines. In addition, the noise generated at higher speeds makes the attacking submarine easier for defending forces to detect, target, and destroy. Thus, once United States warships have reason to believe that they are close to an enemy submarine, an effective tactic for evading the threat would be to increase speed. With a 20-knot fleet replenishment oiler as part of the battle group, the group's ability to sprint away and evade enemy submarines may be limited, and the effectiveness of this tactic reduced. Given the high value of the supplies carried by replenishment oilers, leaving these ships behind--and potentially less well defended--during a sprint is highly undesirable. The ability of battle groups to deploy rapidly in a crisis is also limited by the replenishment oilers' relatively slower speed. In a crisis, battle groups based in the Atlantic that are equipped with fast combat support ships will arrive at trouble spots--for example, in the North Atlantic or the Mediterranean--several days before battle groups traveling with replenishment oilers. The difference in response time in the Pacific theater would be greater because of the longer distances involved. If enacted by Congress, the shipbuilding plan or Combat Logistic Force (CLF) ships would eliminate most of the shortfall projected by the Congressional Budget Office. As shown in table 28, the administration requested authorizations for three AOEs, five AOs, and two AEs at a cost of 2.7 billion dollars--about 6 percent of the budget for new-ship construction for the 1989-92 period. This was significantly greater than the 4 percent average spent on CLF shipbuilding and conversion between 1962 and 1988. Funding was also requested to complete the conversion of the five Cimmaron-class oilers begun in 1987. These were being enlarged by inserting a "plug" amidships to increase their cargo capacity from 120,000 to 180,000 barrels. When Iraq invaded Kuwait in August 1991, the U.S. Navy was close to the six-hundred-ship size earlier envisioned by Lehman and was in the best material condition since the end of the Vietnam War. Had Saddam Hussein, Iraq's despotic leader, chosen to proceed into Saudi Arabia, naval air would probably have played a pivotal role in the defense of that country as had occurred forty years earlier when the North Koreans invaded South Korea. Fortunately for the United States, this did not take place, allowing the U.S. military the luxury of a six-month buildup before commencing hostilities. By January the navy had deployed six CVBGs (a seventh would later be assigned) to the Middle East as part of the huge buildup of what was to become the largest air warfare campaign in history (see table 29).10 The number of ships sent to the Persian Gulf and the Red Sea was the largest deployment of U.S. naval forces since World War II. In addition to the six carrier battle groups, the fleet of U.S. warships included two battleship surface-action groups, four amphibious formations, and numerous escorts, submarines, and auxiliaries. 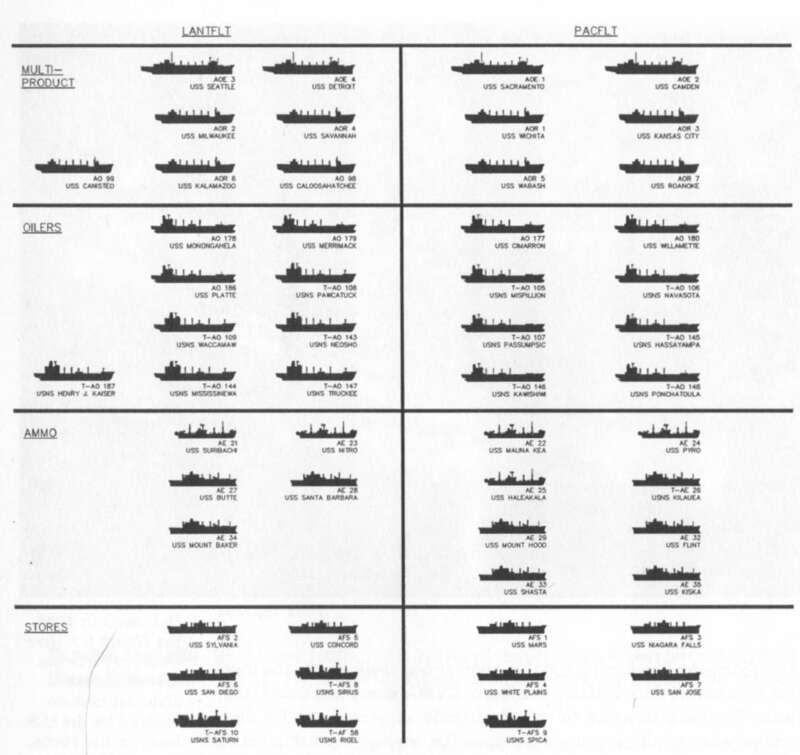 SOURCE: Congressional Budget Office, "Issues and Options for the Navy's Combat Logistics Force," April 1988, 20. [a] Budget authority in billions of 1989 dollars. [b] Less than $20 million for outfitting and post delivery costs. First civilian-manned, Military Sealift Command ship to deploy with a carrier battle group. Unlike the coalition's fixed air bases, the carriers were relatively difficult for Saddam's forces to attack. The coalition had no way of knowing before war broke out, that Saddam would be unable to use his relatively large offensive forces to hit those fixed facilities. A single gas warhead onboard a Scud Missile, for example, might well have put an air base out of action.13 Carriers in the Persian Gulf enjoyed a different advantage: at less than two hundred nautical miles, they were closer to southern Iraq than any airfield ashore. Once in position well up in the Gulf, they were able to attack important targets in Iraq almost at will after the destruction of the Iraqi air defense system on the opening day of the campaign. The Theodore Roosevelt (CVN-71), in particular, achieved very high sortie rates. 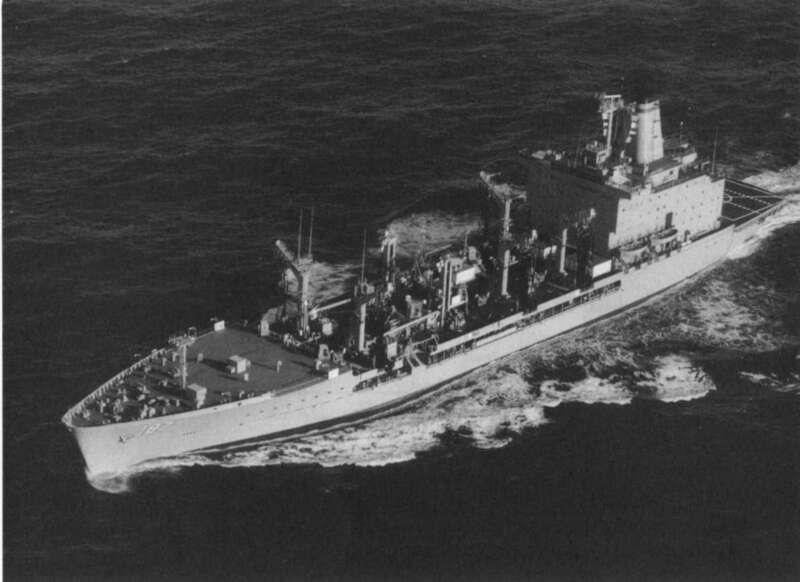 Replenishment under way varied little from that achieved in the latter stages of Vietnam. Carriers typically replenished every three to four days with little loss in operating time since CLF ships could operate quite close by without danger after the Iraqi threat to coalition naval forces was so thoroughly demolished. In the aftermath of the Gulf War and the collapse of the Soviet Union that followed, the United States emerged as the only surviving superpower. The demise of the Soviet Union also brought an end to the Cold War and with it a reduction in military spending. The six-hundred-ship navy was an expensive luxury no longer needed.